In continuing with our CP x Tomenosuke sofubi anatomy series, we now turn our attention to Kathie Olivas’ Calliope Jackalope, who we anticipate to see at Le Carnaval des Spectres this September at Artoyz Paris. 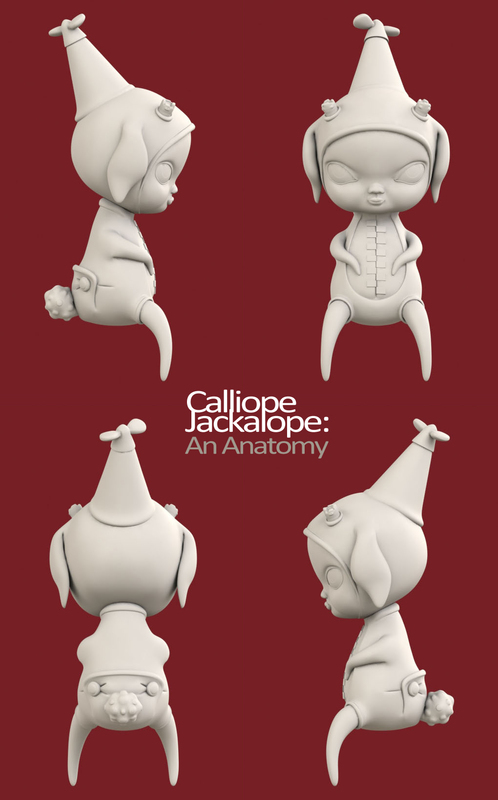 Unlike Brandt’s Stingy Jack, there was no pre-existing master sculpt for the Calliope Jackalope, which meant she had to be made from the ground-up. With Teodoru Badiu again at the helm of 3D rendering, he created the digital turns of the figure. 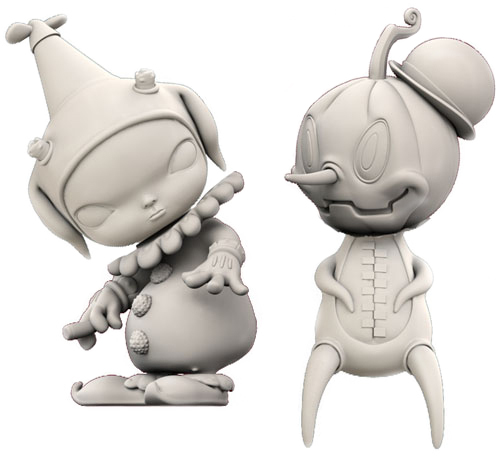 Stingy Jack sculptor Yohei Kaneko of Mirock Toy would return as sculptor for this project. One of the really interesting features of the CP sofubi project is the goal to have interchangeable heads between all of the figures. That also presents many obstacles, however, as was discovered while sculpting Calliope: in order to support Jack’s head and have it look natural, Calliope’s backline and shoulder width had to be adjusted. This element of interchangeability will have to be taken into account with each subsequent release and, while a challenge, may very well yield both impressive and playful results. And here she is, in all her glory: after repeated modifications and adjustments to the figure to accommodate Brandt’s Stingy Jack and preserve Kathie’s signature style, the prototype was approved the evening of the Monsters & Misfits II opening in Takayama, Japan, last April. Which means: we’re off to get waxed!